I had a call from Andy Rhodes, an English born actor who now lives in Melbourne. He is shooting a documentary that he’s written called Unlucky In Love. Set in England, it’s about an unfortunate squire who has lost his first and second wives to tragic mis-adventure. Guess who had to supply the Miniature Herefords who had stopped their murderous stampede and were back to their innocent, harmless selves. Little did you know that within every mini’s heart lies a wild beast capable of cold blooded murder!! 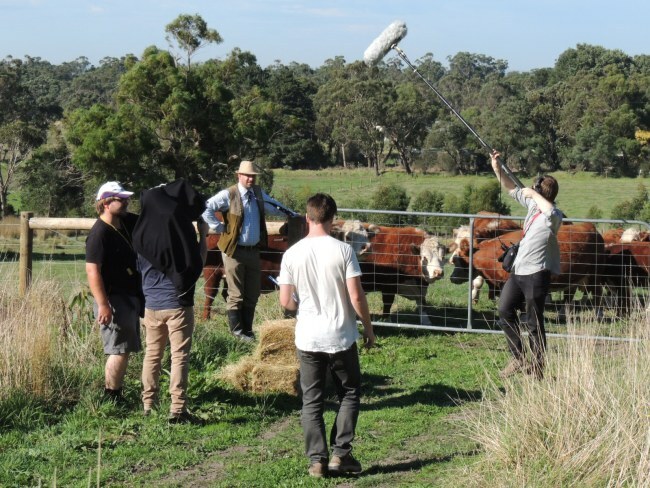 I photographed the making of the clip and we all had a most enjoyable morning with a bunch of bovines who took to stardom with aplomb and professionalism.